The beginning of 2019 gave us the 10-year-challenge on social media. It’s a simple task to participate, you post a picture of yourself now and ten years ago online, add a catchy caption (or not) and you’re in. It’s been discussed as a way to show off your great fortune,potential data mining event, and a vehicle for environmental activists. But I want to talk about the storytelling lessons we can learn from it. Last week, I inadvertently participated with this post on LinkedIn. I wasn’t thinking about the 10-year-challenge when I wrote it. But this post has been out-performing every other thing I put on LinkedIn in 2019. As of today noon, it had 2,445 views. The next most viewed post had 252 views. That’s a difference that deserves attention. Whatever this one post had to teach me, I wanted to get to the bottom of it. Then it occurred to me that these posts with two images side-by-side all told a story. More specifically, they show us the beginning and end of a story. The images show us a hero then and now. Each of those heroes has endured a challenge in the intervening years. As an audience, we fill in the middle. When we see a picture of a friend ten years ago next to a picture of them today, we recall all the things they have gone through. We know about the job that changed their lives or the children that entered their lives, or the loss or illness that challenged them. Two images summarize an epic journey. At the same time, if we don’t know anything about the person in the pictures, our interest is more superficial. Oh, they’ve aged well, or wow, they’ve lost a lot of weight. So, the images that evoke a story for us are more powerful than those where the middle is left empty. This explains the impact of celebrity 10-year-challenges and the climate change images. An example that caught my attention was Jessica Simpson. Her before picture is a young woman in daisy duke shorts showing off her legs and amazingly well-defined calves. Her after picture is just her left foot, incredibly swollen. 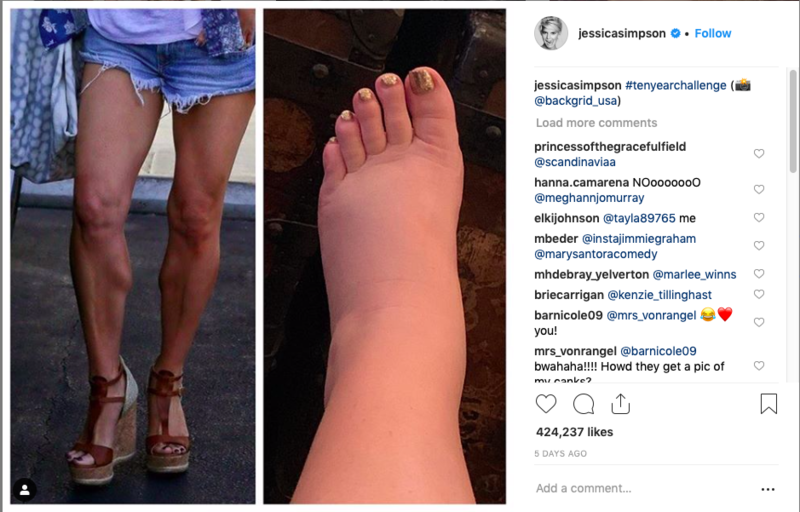 If you’re a devoted follower of People on-line (and I am, we can talk about that another time), you know that Jessica Simpson is currently pregnant with her third child. These two images show a person who has travelled far in ten years. The first image celebrates a beautiful body and seemingly carefree life. The second image shows us that every woman’s body works hard during pregnancy. It’s not a beautiful bump cradling shot, but a gritty skin shot of a different kind. It shows a different relationship with her body than the first image. So, these 10-year challenge images tell stories. They are micro-stories like flash-fiction or the New York Times Tiny Love Stories series of 100-word stories. They contain the most basic elements of story are complete even though they’re short. Here’s a way to think about it. A story can consist of three parts that have a particular relationship. The first is a moment. The second is an event. The third is an event that is opposite to the first. In the 10-year challenges, we see the first and last parts of the story. In Jessica Simpson’s case, the first is a moment of glorious, beautiful, youth. The second is become a mother. The third is the ugly truth of pregnancy. Is there anything more opposite to glorious calves than unbearably swollen feet? My LinkedIn post worked similarly, although through caption rather than images. 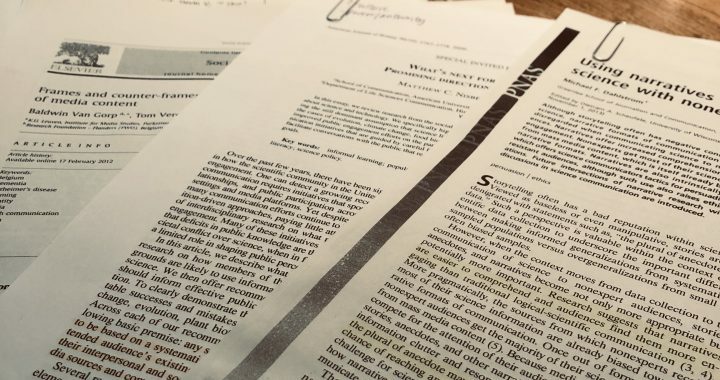 I used to read academic papers to work on my PhD. Then I gave it up to focus on my family. Now I’m reading them again, but not for my PhD anymore. 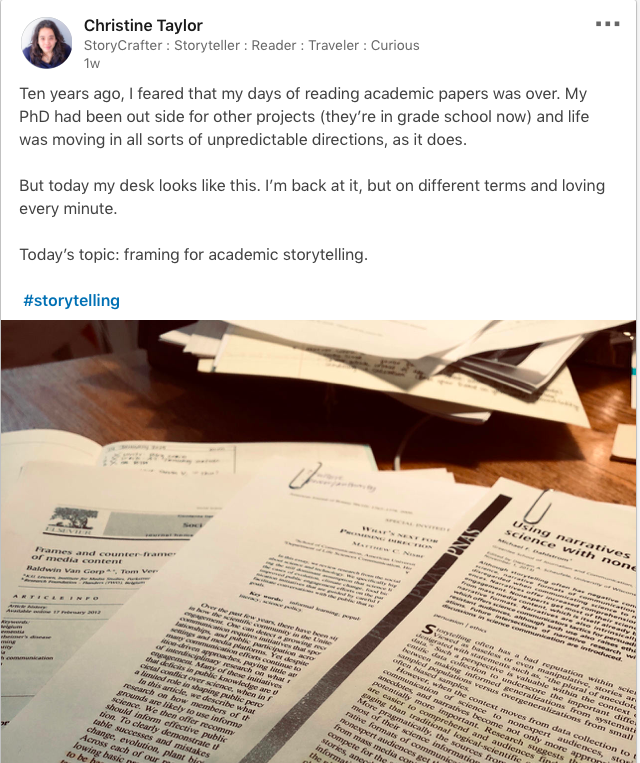 Aside from being a beautiful way to tell a story, my 10-year challenge post did something unexpected. It connected with my audience in a powerful way, as indicated by likes and post views. It proved to me again that if you tell a story, you can connect with your audience in a more meaningful way. Have you participated in the 10-year challenge? Will you do it now? What story will your images tell? Like this article? Want to hear more? Sign up for the StoryCraft mailing list! Posted in Story Structure and tagged inspiration, methodology, structure, writing.